If you're like most people, you want to build a successful life and career but you're not sure exactly how to go about it. 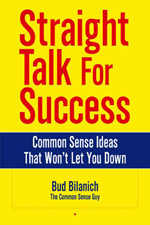 My new book, Straight Talk for Success, can change all of that. I am an executive coach, keynote speaker, leadership consultant and author who has spent the years studying what it takes to succeed in your life and career. I have found that successful people share five traits in common. 1. Successful people are self confident. 2. Successful people have positive personal impact. 3. Successful people are outstanding performers. 4. Successful people are excellent communicators. 5. Successful people are interpersonally competent. Here are some of the things I suggest you do to become self confident, create positive personal impact, become an outstanding performer, excellent communicator and interpersonally competent. a) Become an optimist. Look at the bright side; don't let problems and set back stop you from achieving your goals. b) Face your fears and take action. Identify those things that you fear. Admit our fears. Accept your fears. Take action. c) Surround yourself with positive people. Actively seek out positive people. Rid yourself of the negative people in your life. Find a mentor to guide and help you. a) Create and constantly promote your personal brand. Figure out what sets you apart from everyone else. Capitalize on your uniqueness. Remain on brand all the time. b) Dress for success. Dress appropriately for your job. Observe the successful people in your company - dress like them. Make sure your clothes fit, are clean and in good repair. Keep your shoes looking good. c) Know, understand and practice the basic rules of etiquette. Good manners never go out of style. Do whatever you can to make the people around you feel comfortable. Use two simple, but powerful words - please and thank you. a) Stay technically competent by becoming a lifelong learner. Join and participate in professional societies. Get an advanced degree. Read. Attend seminars and workshops. b) Set and Achieve S.M.A.R.T. (Specific, Measurable, Achievable, Results Oriented, Time Bound) goals. Write your goals. Review them frequently. Share them with your friends. Take at least one positive step towards one goal every day. c) Get organized. Adopt the Pareto principle - focus on the critical few, not trivial many things competing for your attention. Set priorities and stick to them. Do what's important, not urgent. a) Develop your conversation skills. Learn and use people's names. Ask them questions. Listen and respond appropriately to what they have to say. b) Develop your writing skills. Write like you speak. Use small words and short sentences. Avoid jargon - or explain it as you go. Read what you've written. Edit and rewrite until you're happy with it. c) Develop your presentation skills. Determine your message. Analyze your audience. Organize your information for impact. Create supporting visuals. Practice out loud. a) Understand yourself. Use a commercially available instrument, like the MBTI or DISC. Or just think about what's important to you and why. Use this knowledge to better understand others. Use your knowledge of others to tailor your communication style to their needs and wants. b) Build strong, lasting, mutually beneficial relationships. Be honest. Be humble. Be courteous. Take responsibility for yourself. Build consensus. Listen well. Respond appropriately. Respect others as human beings. c) Resolve conflict in a positive manner. Focus on where you agree with a person with whom you are in conflict. Build a solution that meets both of your needs. If you put these 15 common sense pieces of advice to work, along with the other valuable information in Straight Talk for Success, you'll be able to build a successful life and career. If you all are playing top eleven and need unlimited tokens then visit this site cheat token top eleven and grab unlimited tokens for top eleven which will be generated within a second and at no any effort. Absence of persistence is enormous issue now a days, that is all because of lack of education and absence of instruction, so our custom essay writing site is to give training worldwide at doorstep of each individual for this simply go along with us through going by our site and get profitable training material. I agree with Julie that there is nothing new here, but thanks to Bob for Keeping It Simple! There's nothing like a short punch list of tips to give you clarity! I'm sure Bob's book is quite good, but as far as I can tell there is nothing new here? My mentor has been telling me these things for years and has actualy shown me how to do them - perhaps Bob's book does that, but you can get the same information for free on the internet (including on this website!) so why buy a book about it. I just think these stories should be about real personal experiences and not for advertising your book. I haven't read Bob's book, but the tips in this article are an excellent summary of how to be successful in your career - and are in sync with the information offered on the Achieve Goal Setting Success website. If anyone has read Bob's book, it would be great to hear from you?